Polenta Pizza, simple, quick, pizza flavor without the work, Thyme for Cooking. There is Polenta Lasagne... Why not Polenta Pizza? I'd seen recipes floating around and finally decided to try it myself. Very quick and easy and holds together amazingly well. You need to eat it with a fork, but it's as flexible as a regular pizza for toppings, and much simpler. It's easiest with a traditional, round 13" (32cm) pizza pan with a lip, but you could use any similar size pan, even a cake sheet. Bring stock and water to a boil in a medium saucepan. Add polenta, stirring constantly with whisk or wooden spoon until cooked and thick, about 5 minutes. Pour hot polenta around pan. Spread it evenly with the back of a spoon or a spatula. Set it aside to cool while you prepare the topping. Snip chives. Pull oregano or marjoram leaves off the stems. Slice the mozzarella as thinly as you can, then tear into smaller pieces. Cut the ham into strips or smallish pieces. Cut the olives in half or thirds. Spread sauce around polenta 'crust'. 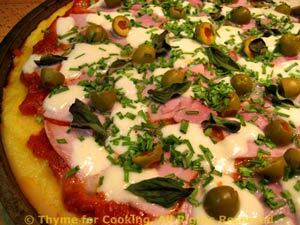 Top with ham, then cheese, herbs and olives. Sprinkle with red pepper if using. Bake in 400F (200C) oven for 10 - 12 minutes, until edges start to brown and cheese melts.